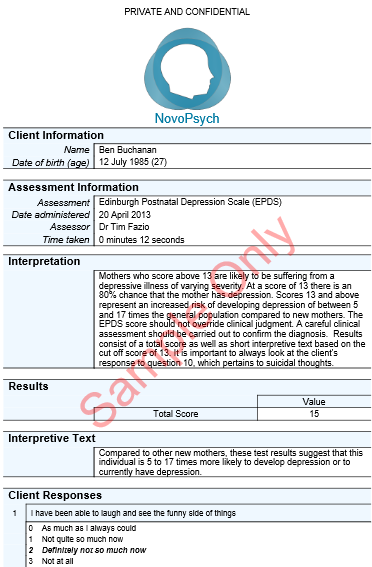 After extensive pilot interviews, Cox, Holden and Sagovsjy (1987) carried out a validation study on 84 mothers using the Research Diagnostic Criteria for depressive illness obtained from Goldbergs Standardised Psychiatric Interview. The EPDS was found to have satisfactory sensitivity and specificity, and was also sensitive to change in the severity of depression over time. Milgrom, Mendelsohn and Gemmill (2011) reviewed existing validation research for the EPDS and found that screening with the EPDS always facilitated an increase in identification rates, over the key range of prevalence values. The EPDS defined a sub-group with prevalence between 5-fold and 17-fold greater than the general population. A central estimate of PPV (at a prevalence of 6.8%) was 62%. Mothers who score above 13 are likely to be suffering from a depressive illness of varying severity. At a score of 13 there is an 80% chance that the mother has depression. Scores 13 and above represent an increased risk of developing depression of between 5 and 17 times the general population compared to new mothers. The EPDS score should not override clinical judgment. A careful clinical assessment should be carried out to confirm the diagnosis. Results consist of a total score as well as short interpretive text based on the cut off score of 13. It is important to always look at the client’s response to question 10, which pertains to suicidal thoughts.